This entry was posted in Facts & Statistics, News & Views and tagged bills, cabinet firings, criminal indictments, games, golf, impeachment, lowest approval rating, provable lies, records, resignations, Trump, unfit, vacation on March 6, 2018 by Ray Buchanan. 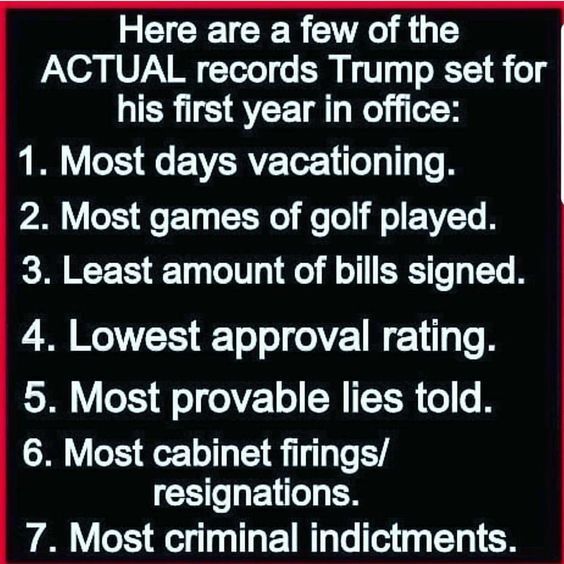 This entry was posted in Facts & Statistics, News & Views and tagged approval rating, bills, BLOTUS, criminal indictments, firings, golf, lies, records, resignations, Trump, vacationing on January 7, 2018 by Ray Buchanan. #BLOTUS has to have time to relax, right? We all know he’s under immense pressure. Surely his time on the golf courses cannot be seen as a dereliction of his presidential duties, After all, who wants a duffer for their leader, right? On the other hand, another 32 million dollars in aid to Puerto Rico would surely demonstrate a compassionate and caring side of this pumpkin-hued moron that the world has never seen. But, to be fair, I guess that the world can never see what is not there. 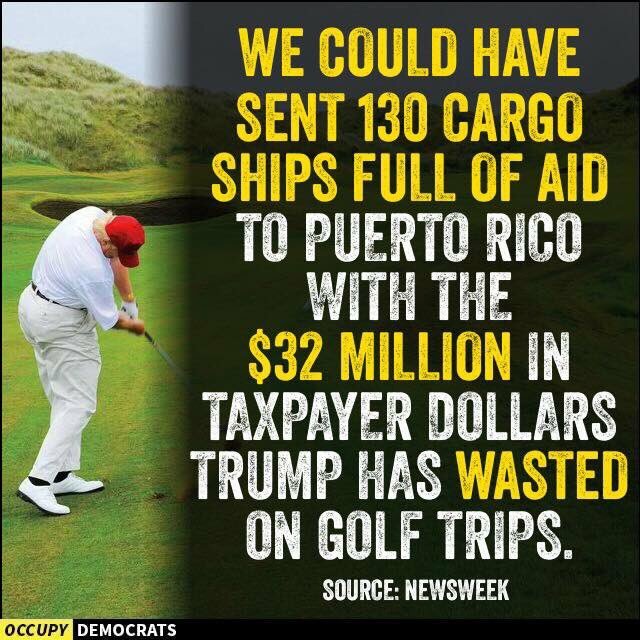 This entry was posted in Facts & Statistics, News & Views and tagged aid, BLOTUS, cargo ships, caring, compassion., disaster response, fair, golf, humanity, leadership, OccupyDemocrats, priorities, Puerto Rico, relief, vacatuons, waste on October 6, 2017 by Ray Buchanan.